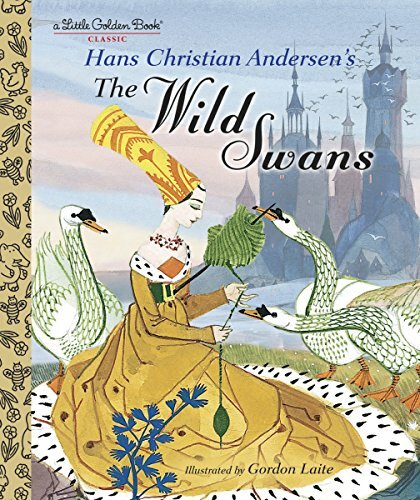 From the Golden Book archives comes a Hans Christian Andersen fairy tale, gloriously illustrated by Gordon Laite in the late 1960s but never published until now! Gordon Laite’s breathtaking artwork for a Little Golden Book edition of the Andersen fairy tale was found recently in the Golden Books archive. Planned for a 1970 release but never published, this Little Golden Book is finally making its debut for today’s fairy tale fans! And it couldn’t be a lovelier retelling of the story of a determined princess whose loyalty saves her brothers from being turned into swans by an evil queen. GORDON LAITE (1925-1978) was a prolific illustrator of children's literature from the 1950s through the 1970s. His lush, dramatic settings brought to life fairy tales, ghost stories, legends, and Bible stories that have been enjoyed by generations of children.